I Decided I would post something for others to mess around with during there free time, And I just felt generous. A Big Note though before I continue. I will List any guidelines in Red, And I expect them to be followed; Otherwise, I will close the thread. Now..on a lighter note..lets get to it shall we? This is what you will use to play a Nintendo DS Game on your Computer. For the Purpose of this Game, I will be posting a Link to my Emulator; As you need the correct Firmware and bio's with the emulator for the game to work properly. The Following Link Will be Hosted Via Rapidshare to get my Emulator. The Link Will be good for 10 downloads; There in after, I will have to re-upload. In the Link is a RAR with the correct Emulator and right Firmware and Bio's to Run the game + cheats. Also Various settings are listed within the RAR, but find what best suits your own personal preferences and computer. If the Link Expires, Simply post here asking me to re-upload the link, and I will be gladly ablauged to do so. If Anyone Begins to Spam though; Then you can Find the correct Emulator yourself. If you don't like the link or wish to find the game elsewhere yourself, By all means do that. The following Link Requires you register a free account before you download. The Game Region is USA Version. I'm going to simply list important Cheats for the game to play everything the game has to offer. Do Not Spam or PM me about other Cheats from What is listed. The cheats I'm posting is to play Single Player to its entirety, So Auto-Win, Inf~ LP Cheats,etc will NOT be posted. 1.) 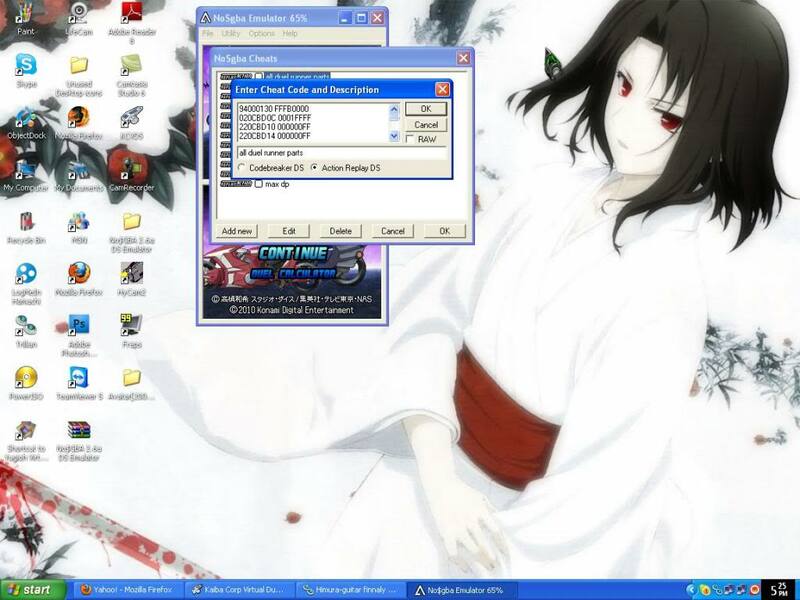 Go under the toolbar on the Emulator window. 3.) Then go to "Cheats"
5.) Click the "Action Reply" Bubble at the bottom. In Case that is a bit Confusing. It should Look like this. To Activate the Following Cheats ( Aside from the no ban-list cheat, which works as soon as you activate it ). Press the "Select" button on your Emulator to activate the "All cards" cheat and the "Cpu" cheats and lastly "all parts/costumes/disc" cheats. Once the game auto-saves, you no longer have to activate or check the box's for those cheats. For those that are not familiar with this issue. Starting in this Game, a Anti-piracy function was put into the game to prevent it from being illegally used. To get around this; You must have two things. 2.) The Following three codes ALWAYS on when playing to prevent a crash. I Repeat, You MUST have all three cheats activated when playing; Otherwise you WILL crash upon playing you first duel. All That I have listed will enable you to play the game and have all "Key" features unlocked. If Someone has a technical Issue or question About the Emulator; Then Post here, Do NOT pm me; that way I can answer it globally for everyone. Also, Please Follow the Few Guidelines I posted In red, As so we Limit any spam as simple courtesy. However, Aside from that, You are more than welcome to leave feedback, and i'll try to answer any questions someone may have. hey there.. I was wandering if you can upload that emulator, if it's not to much trouble.